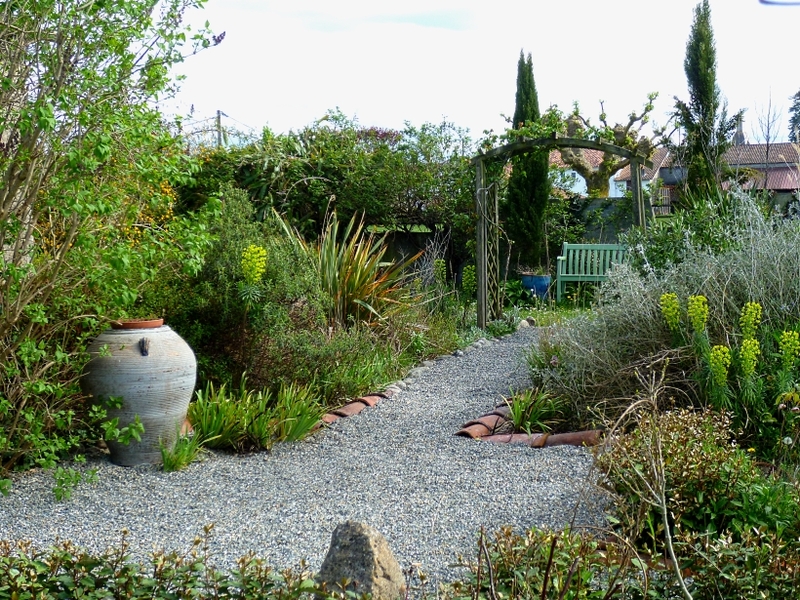 I have followed Dan Pearson and his career from being a handsome, alternative television gardener way back, to now, at the age of fifty or so, having become the master of peaceful, thoughtful gardens, respectful of their place and situation with choice species planting as his speciality. In his writing he has honed an almost zen-like long range perspective on how gardens live and evolve side by side with their human carers. In a very cold and wintry London, I made two small sorties to see his work close up. More than six years ago, I used to enjoy visiting the Garden Museum, and especially, the café, which, managed by several warm and serious women cooks, made great teas, coffees, baking and lunches to enjoy in the tiny graveyard that was tucked away at the back of the old converted church. Since then, the Musuem has undergone a transformation. With no public funding, it has still managed a skilful rehabilitation of the church while Dan Pearson and Christopher Bradley-Hole have brought alive the new Cloister Garden and the entrance/wrap-around garden respectively. 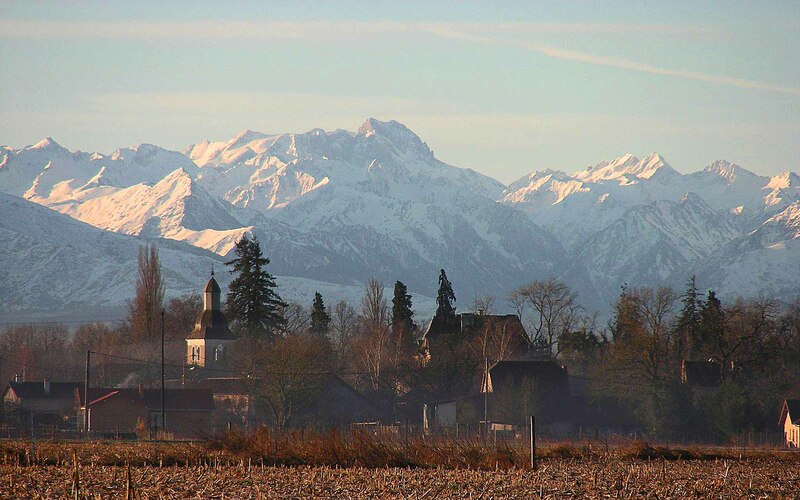 Winter exposes all, and the Garden is not yet a mature planting. 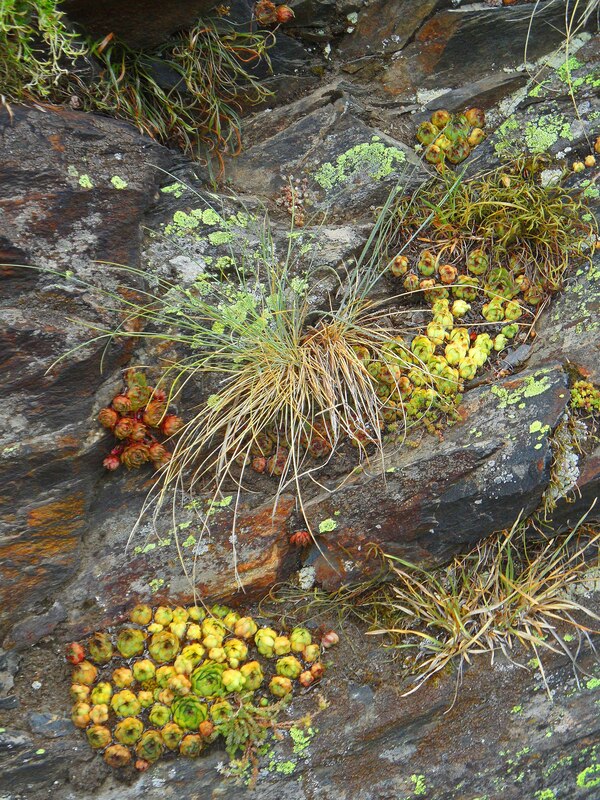 But, the bananas and the astonishing new growth on the Melianthus major, the upright spikes of Equisetum, and the cheery red Nandina domestica berries provided much more focus than you would imagine. The underplanting, a lovely mix of Ophiopogon, ferns and not-yet emerged perennials, was only just on the move, but will make a really lush carpet through which the ‘Garden of Treasures’ will appear. I really enjoyed the use of ancient gravestones, set into the planting, often askew, which will allow you to get up quite close and intimate with the planting. They also remind you, as does the presence of the decorated tombs of the two John Tradescants, father and son, probably England’s first botanical collectors, of the vivid past and people of this small parish in Lambeth. Give it all a year or two more, and this little garden will beautifully evoke the Victorian Wardian case that inspired Dan Pearson. Christopher Bradley-Hole is another designer who seems almost modest in his search for a simple aesthetic which favours harmony and purpose, rather than decoration. I thought his 2013 Chelsea garden was a stand-out, though it seemed unassuming in comparison with some of the richesse on display in other gardens. He has opened up the entrance of the Garden Museum with sweeping yew hedges which embrace and create a generous curved and gravelled courtyard space, simply opening up the ancient church buildings to their Museum function. 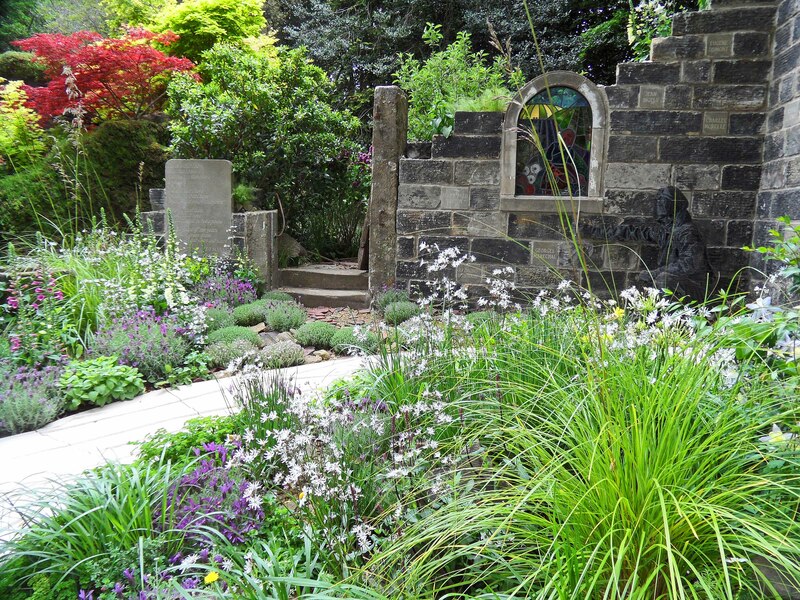 Using the existing flat and standing tombstones, he has planted amongst them, using a mix of ferns, perennials and grasses to populate these tiny spaces. 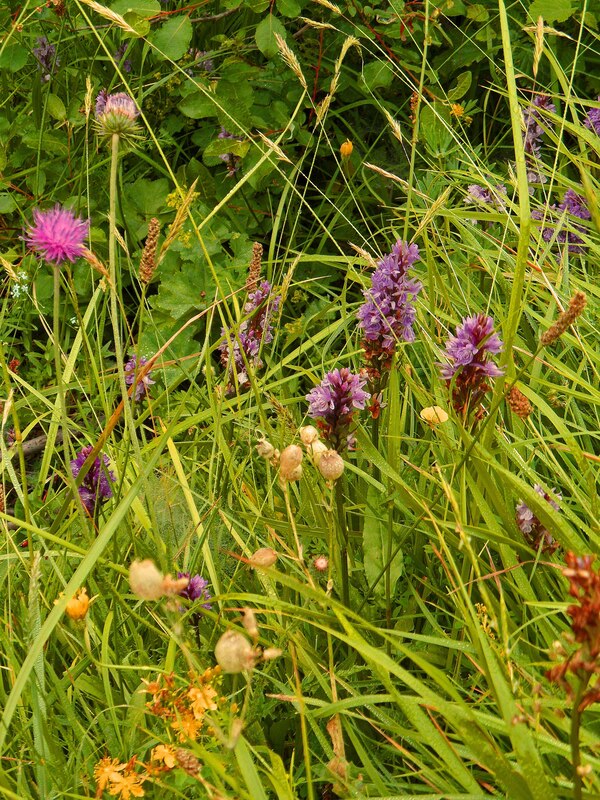 This makes little rivers of mixed planting around the stones, bringing them into focus and linking with the use of stones in the Cloister Garden. There is no bling- and a real economy of focus. The planting towards the boundaries of the Entrance Garden links to the small public space nearby of St Mary’s Gardens, a very tiny smile-shaped area between the Museum and the busy traffic of Lambeth Palace Road. Bright red Cornus stems spear upwards, maybe ‘Midwinter Fire’ but could be the species Sanguinea, surrounded by clumps of tall Hellebores and bulbs, ferns with probably hardy geraniums to come. Simple, semi-shade loving with the tall tree canopy to contend with, and very lovely. As part of the festivities described earlier, a group of 16 of us also spent a couple of nights at the fabulous Centre de Montagne at Germ. Probably best described as ‘hostel-plus’, the Centre de Montagne has scored a tremendous hit with the opening of ‘Chez Lily’ their bistro and bar just beneath the Centre. This transforms the atmosphere with its quirky tapas and meals menus, great wine and concerts/music throughout the year, and such nice people run it. What a delight. 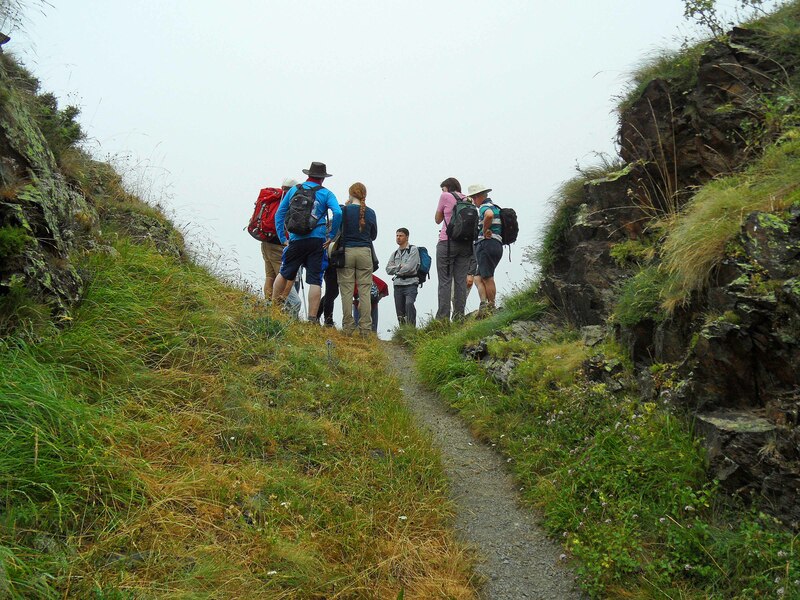 However, despite the attractions of the bistro, we did tear ourselves away and stroll along the GR10 on a very misty, cool day rather reminsicent of Scotland- which was actually a lovely, refreshing change from the heat and sun of previous days. 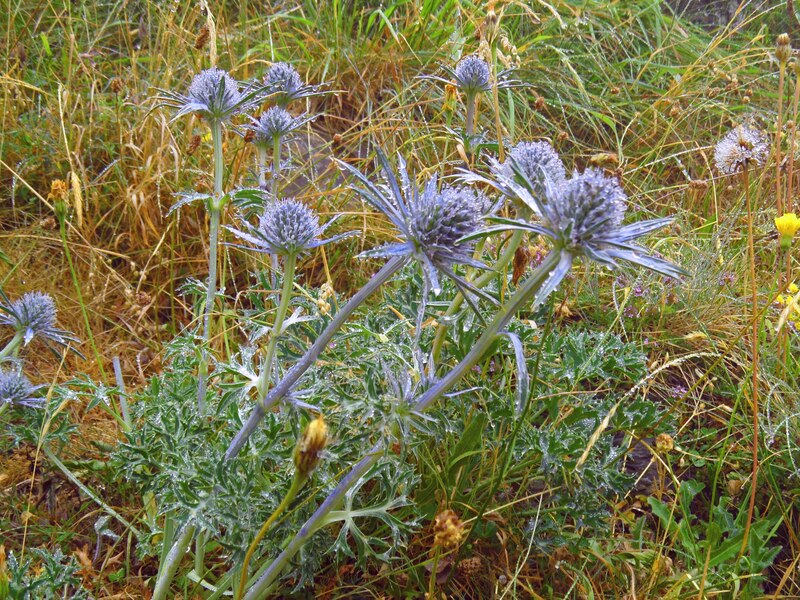 The GR10 was filled with interesting plants revelling in the moistness of the day. 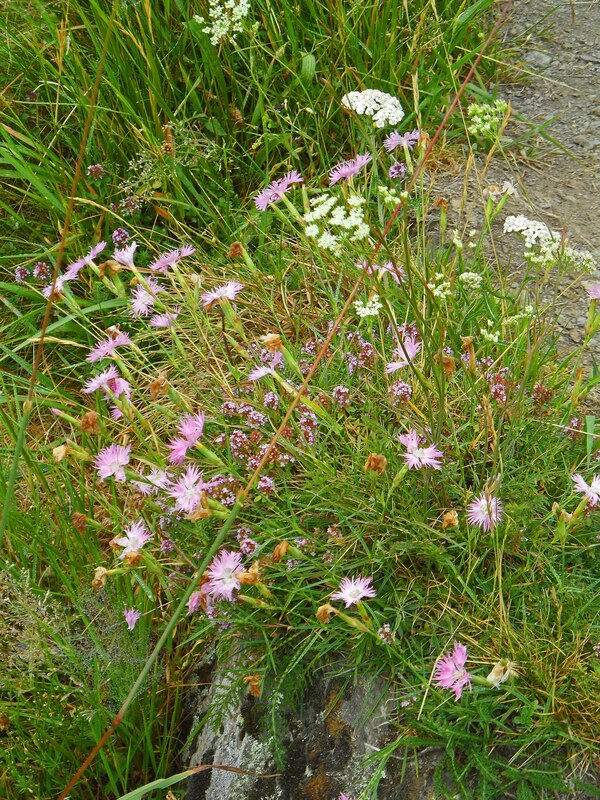 Dianthus plumarius, the wild dianthus of the Pyrenees, was flowering everywhere, very pretty, with pink/lilac fringed flowers. For more information about the garden variety, click here. The pyramid orchid, Anacamptis pyramidalis, could also be seen- not numerous, but in one or two small drifts close to the path. Everywhere, like so many discarded paper tissues, were the nests of the funnel spider, apparently native to Andalucia, and maybe turning up on the French side from imported olive trees. 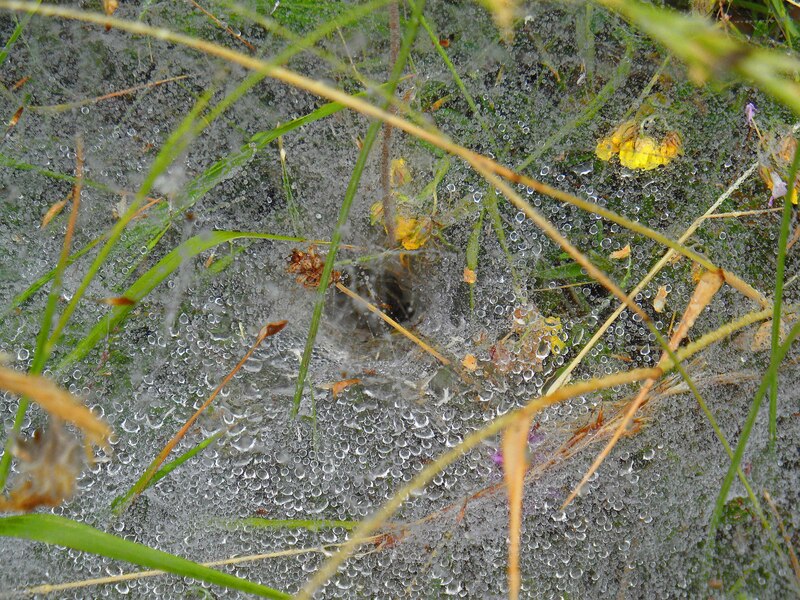 The spider waits in the funnel for its prey, and is difficult to see. 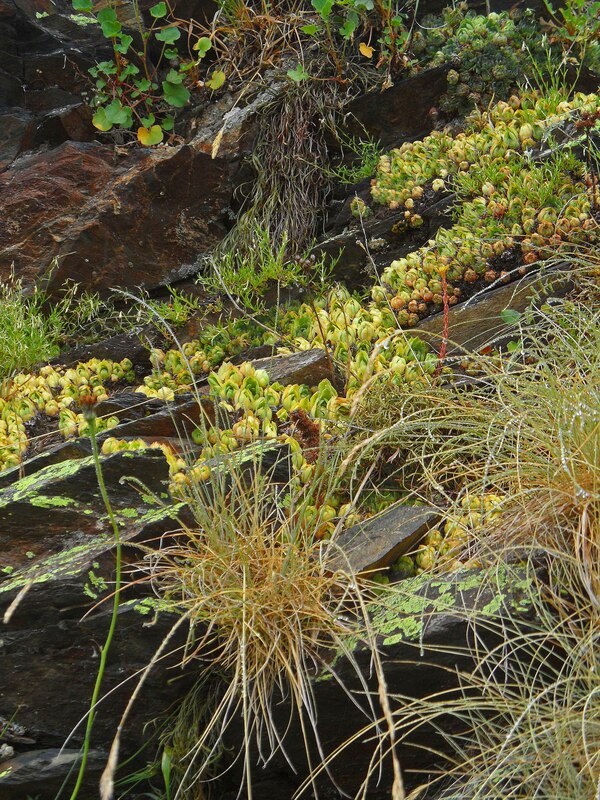 At one point, we passed a spot where, quite naturally, a group of sempervivums and grasses had populated themselves into a rockery display that Dan Pearson would have been proud of….I think, again from the net, that they were Sempervivum montanum, with the yellowing indicating the level of stress the plants were suffering due to the heat and very dry conditions of the past few weeks. Chelsea 2015: when white isn’t always right…. This year at Chelsea, I found myself being more critical than usual. 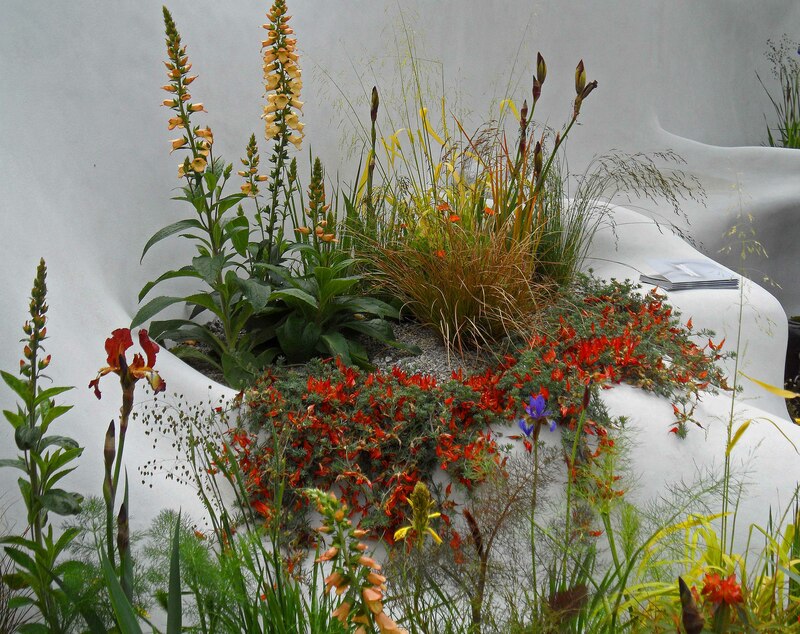 Probably not a bad thing, maturing into an ‘Occasionally Crotchety Gardener’ perhaps, and perhaps also it was watching ‘The Great Chelsea Garden Challenge’ and realising, durr, that judging is about delivering the brief- and that can be all it is about. So, I was interested to see at Chelsea two gardens that used a vast amount of white as a backdrop, and wanted to compare how that worked. Fernando Gonzalez for the Pure Land Foundation, Chelsea 2015. This garden was really an artwork in disguise. 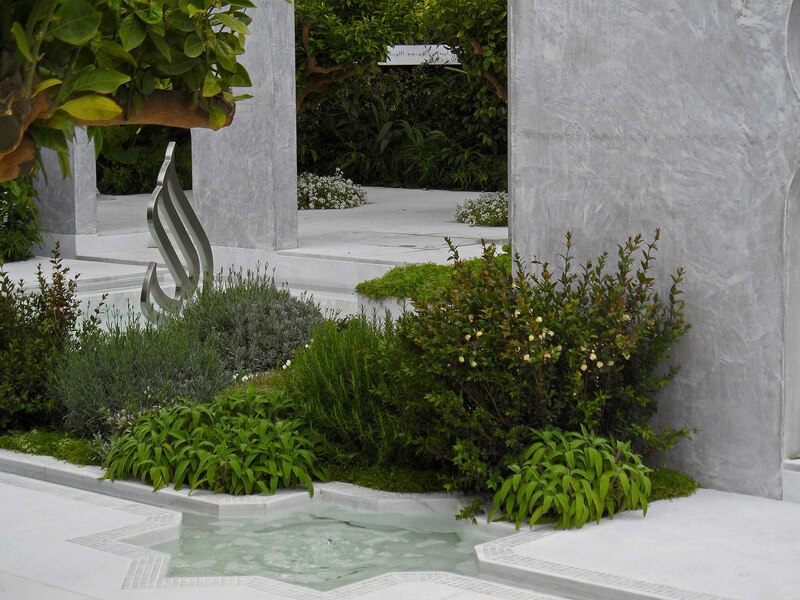 In this garden for the Pure Land Foundation, Fernando Gonzalez used this extraordinary, light, glistening Jesmonite in generous wave forms which embraced the planting. It also had the magical effect of heightening the detail, providing beautiful silhouettes of the plant forms against the white. I have always been a sucker for a multi-stemmed tree, and these Koelreuteria paniculata were especially elegant. The planting was fresh and vibrant with blues, oranges, apricots, yellows and it managed to be both light and airy. It was also, by comparison with other gardens, planted quite sparely, but with real finesse in the way he used the nooks and crannies of the waveforms. I thought it was fabulous and far classier than it’s silver-gilt award. 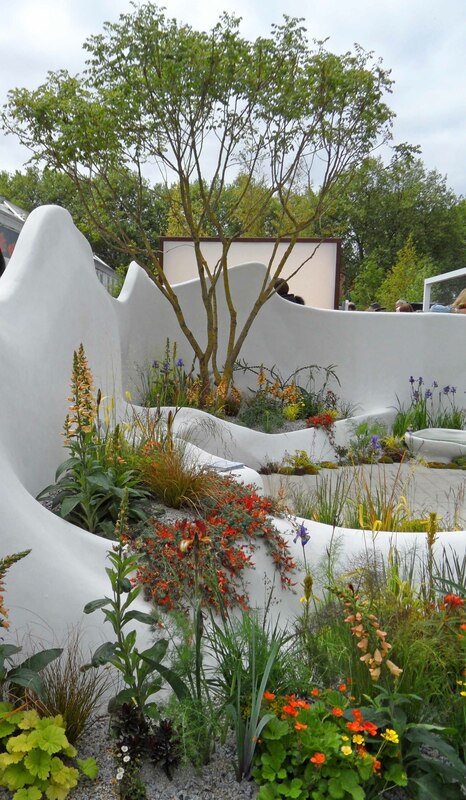 The other garden that used white on a grand scale was the ‘Beauty of Islam’ garden by Kamelia Bin Zaal on Main Avenue. I thought she had made a good choice to work on the diagonal, and to make the most of her arches and opportunities for views into the garden from many angles. 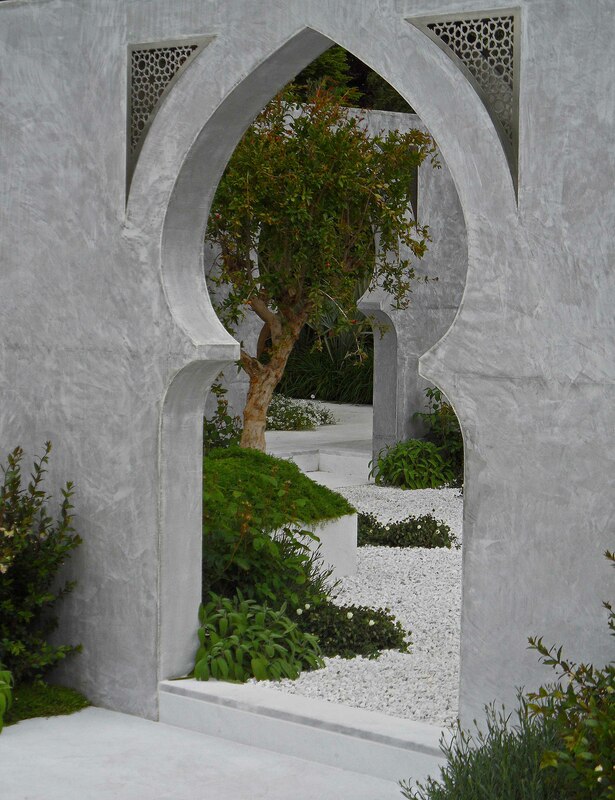 But for me, the white was toothpaste-white, and too reminiscent of an airport departure lounge, while the arches were just too small, making the garden feel as if a big hand had squashed it, with the exception of a tall palm in the top left hand corner. And the planting was dull. The design choice to stick with herbs, palms, and one or two roses that were too cold to flower, poor things, was not a brave one. Compare what Bin Zaal achieved with the power and vibrancy of the Gonzales planting above- no contest in my view. Next year, the Arab Institute in Paris is planning a major exhibition on Islamic gardens- so I will be there then. Perhaps September? Dates not yet announced. 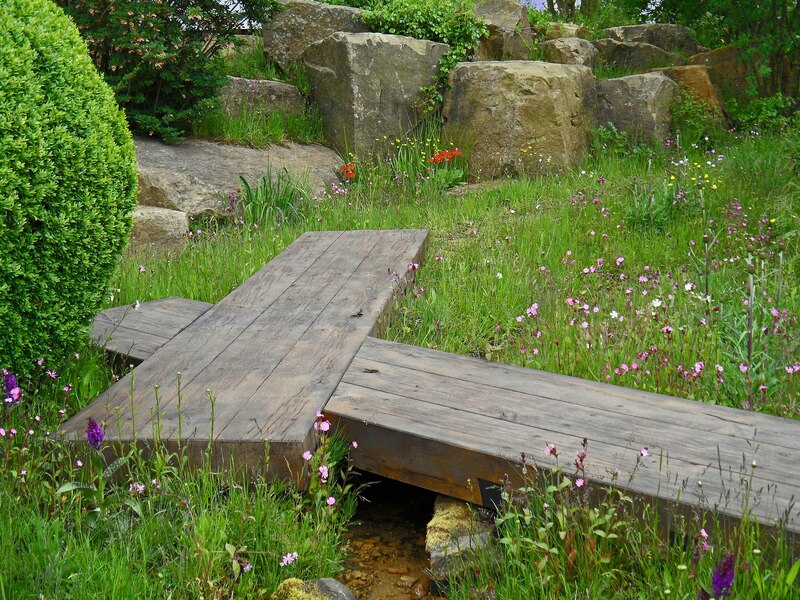 And here are some of the little details that I loved at Chelsea this year…First example is an entire garden, ‘The Evaders Garden’ by John Everiss for Chorley Council– here an escaping airman crouches by a ruined church, waiting for help from the people whose names are engraved on the church walls. 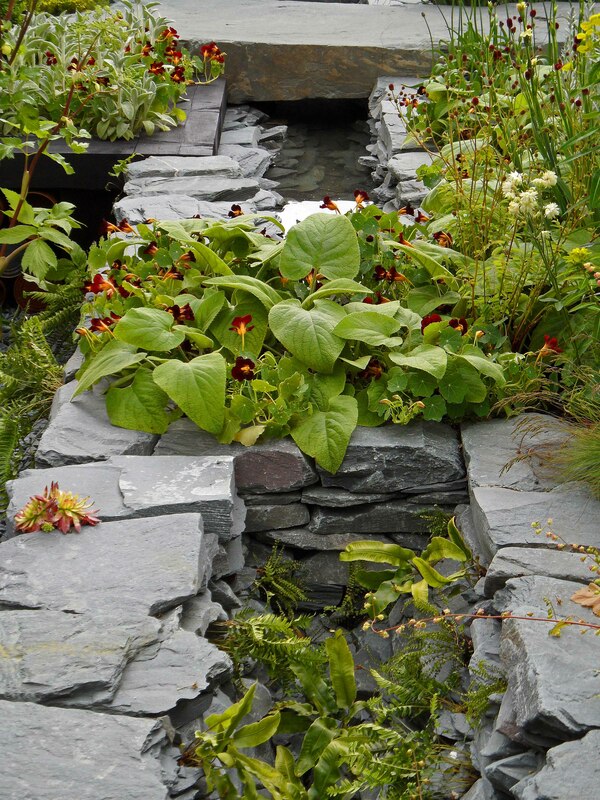 A moving garden with details recalling the real bravery of those experiences. John Everiss for Chorley Council, Chelsea 2015. The following photograph doesn’t quite capture the glow of this planting. I loved the square shapes of the Telegraph Garden by Marcus Barnett, and particularly liked the short and tall yellow combination. In between the incredible rocks and the immaculate detail of the planting, Dan Pearson still found space for some shaped green, see left in the photograph. His garden had it all, scale, detail, colour and a design that really made the most of the triangular plot. I also really liked the wooden landings which projected into the garden as below. And these lovely little nasturtiums in the Main Avenue garden of Sean Murray, the winner of the TV ‘The Great Chelsea Garden Challenge’- there was much to be admired in his debut. Just could have done without the tin can doughnut sculpture…. Last summer, I had a real treat, courtesy of ‘Abebooks’. Abebooks is a brilliant site for secondhand books, and is my first port of call when I want to buy anything that isn’t hot off the press. I bought 2 Dan Pearson books and really enjoyed them both. 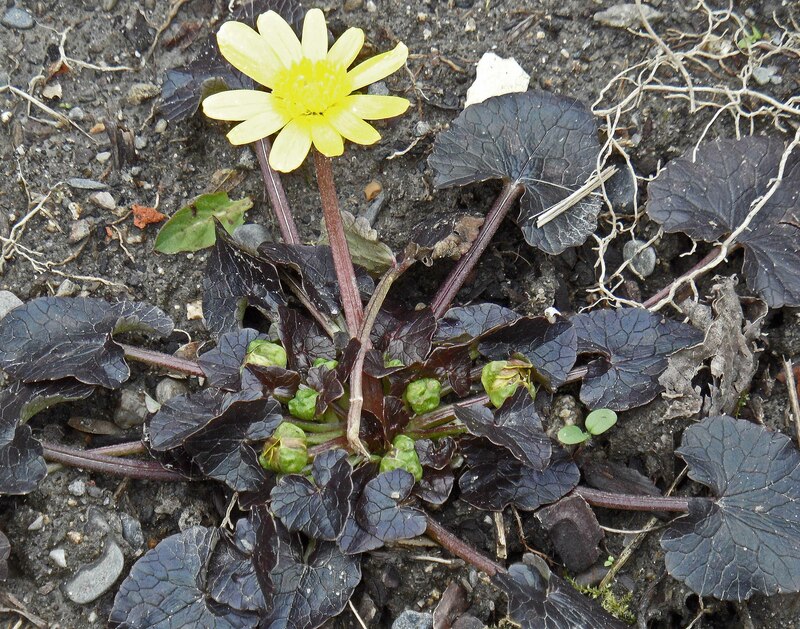 In ‘Home Ground: Sanctuary in the City’ there was a short piece on Ranunculus ficaria ‘Brazen Hussy’. I love the ordinary celandine, Ranunculus ficaria, and there is a spot in the garden, normally hard-baked in the summer, which is positively wet in the spring. We get a lot of rain late winter and in the spring, and there is a dip in the ground where water collects and also, probably because of a kink in the old roof, rain comes down from the roof in a spout. 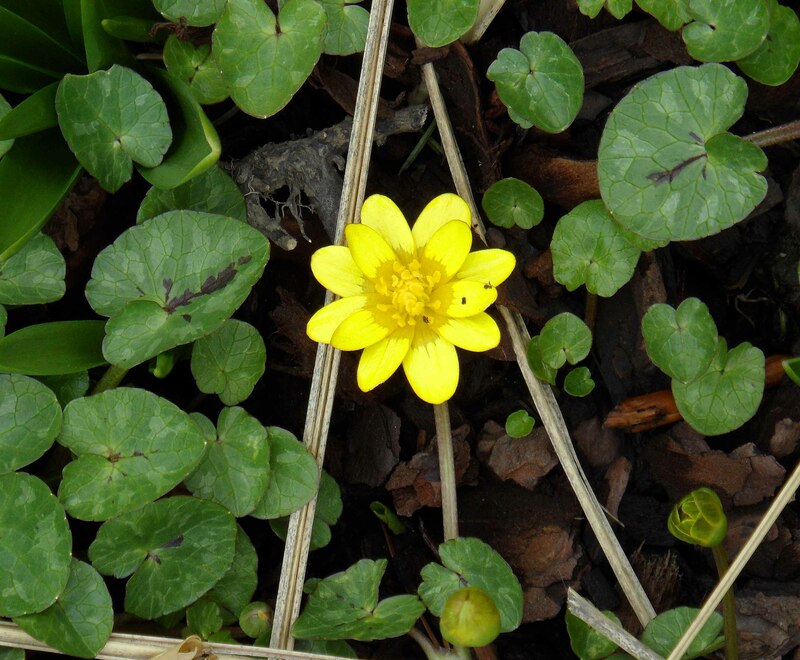 So it is really damp, and the native celandines pop up in a matter of weeks ít seems. Dan Pearson caught my attention with ‘Brazen Hussy’. A great name for a sport spotted by Christopher Lloyd in his garden at Great Dixter, and being a man for bold names, ‘Brazen Hussy’ was what he chose. So there they both are. 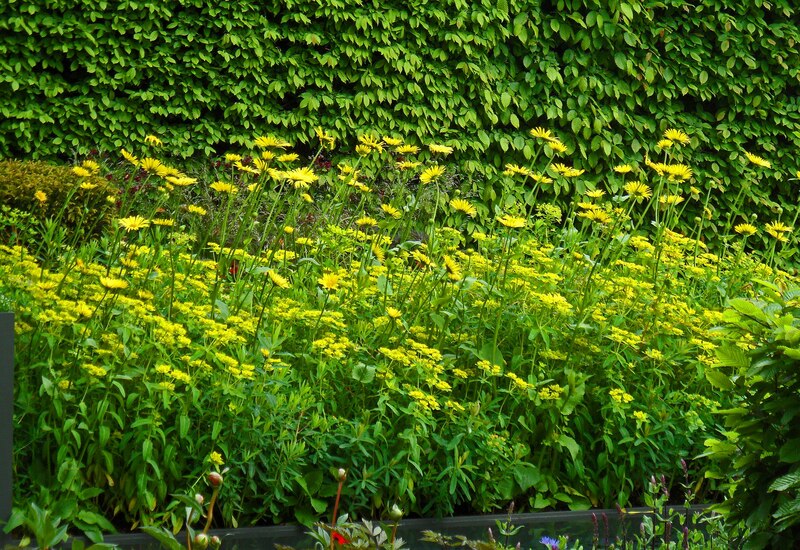 ‘Brazen Hussy’ is a dark bronze-leaved variety with glowing yellow petals and quite big flowers- the yellow is almost blinding and for a small plant, it really packs a punch. I could only find this at a couple of French online nurseries at a serious price, so I bought just three small plants last autumn, and dug them in near to the house, so I wouldn’t have to go hunting for them. For a lot of the winter, they looked very soggy and unprepossessing, and then, despite our biblical rain, they responded immediately to the lengthening light in February and I could see buds forming. So the picture above is of the very first flower and you can see the number of buds still in the wings. I know from Dan that they die down after flowering, but continue powering away at the root level, so I am planning to move a good plant of Cenolophium denudatum that I grew from seed to grow up and over them. It will be slow to start up in the late spring, and so they will suit one another very well hopefully. I have to admit that I found a good price for ‘Brazen Hussy’ at a Belgian nursery online, so there are three more small plants on their way to help make more of a clump of them together. I really love them. 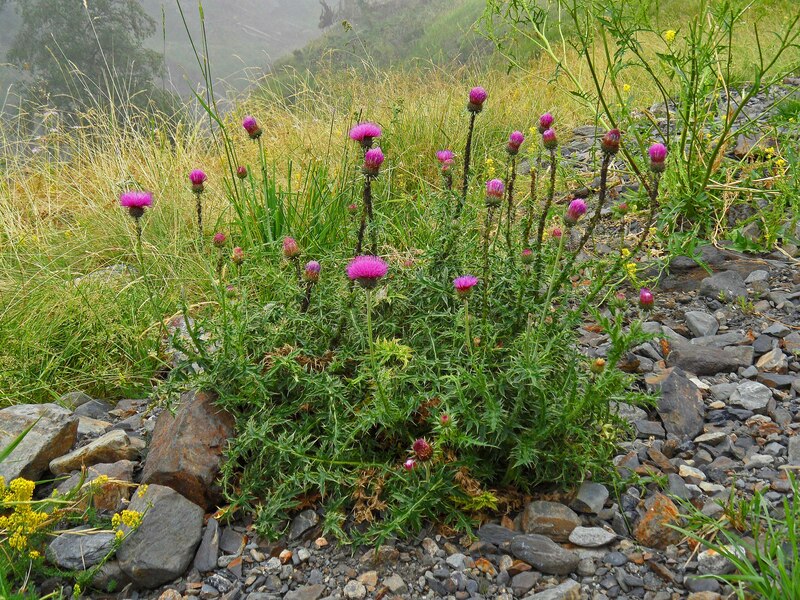 It’s a small price for abundant cheerfulness despite the weather. PS I forgot to mention ‘Louis the Geek’. He writes a great blog and I am signing up for it. His piece on ‘Brazen Hussy’ is here.